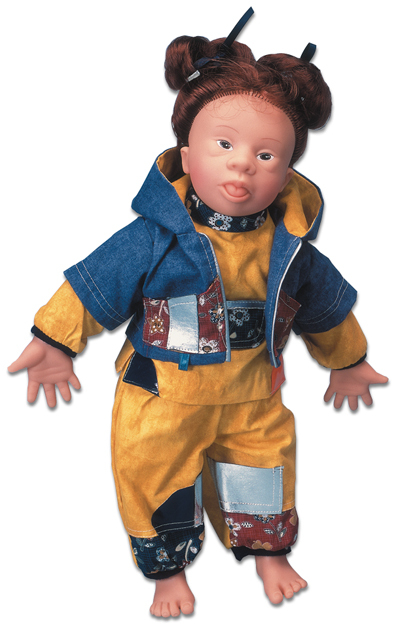 The Down’s Syndrome Doll was designed to promote self-acceptance and self-identification of children with Down’s Syndrome. The Down’s syndrome doll displays the following typical features: Open mouth, round face, short hands, almond shaped eyes, widened space between first and second toes. Available as caucasian male or female, latin female, african-american male or female, or asian female. This entry was posted in images, linkage. Bookmark the permalink. It’s not like they don’t know what they look like. There are also dolls for other disabled kids, like dolls in wheelchairs or on crutches. I think it is important for a child to have a toy identify with. Same idea is behind making dark-skinned dolls – would you also object to those? This is just straight up ridiculous. Have a little tact ffs. When I posted this, I only quoted the catalog that sells the doll and made no additional comment. I thought that this is fascinating for its open-endedness. There are so many things that make this doll interesting. I teach college genetics, and I thought this remarkable because it is so realistic. They really went to great lengths to reproduce the trisomy 21 symptoms: oversized tongue, almond shaped eyes, shortened hands etc. – all straight from a medical book. Notice these are the things I included in the quote. Chromosome disorders like this are an example of synergistic gene action and chromosome-to-phenotype relationship, both hot areas of research nowadays. There is also the ethical conflict brought up by the commenters above: should we strive to make dolls that look like someone? If you buy a doll that looks like your child, is it good parenting or is it a symptom of a sick capitalist society that has everything and too much of it, too? Should african-american kids play with specially-made dark-skinned dolls? How about the Golliwogg dolls – are they a racist parody or do they serve to introduce the acceptance of minorities into mainstream? What about dolls for disabled children – with crutches, wheelchairs, or leg braces? One of the readers of this blog, a pediatrician, showed this doll on a medical conference, and they had a very interesting discussion about these very topics. Somehow people feel very strongly one way or the other, as the comments above demonstrate. I thought it was interesting to get people to justify their position. Thirdly, this doll is fascinating because it crosses several categories: it is both a medical education tool (look who sells it), it is a piece of art, and it is also a toy. People tend to perceive it differently because of this ambiguity and that’s why it is so controvercial. I wanted to keep this open to discussion rather than force my own perception onto others, that’s why I did not add anything to the picture and the catalog description. Unfortunately, some visitors see nothing but an attempt to mock the handicapped. Your indignation is misplaced, amigos; the mockery is in the eye of the beholder.